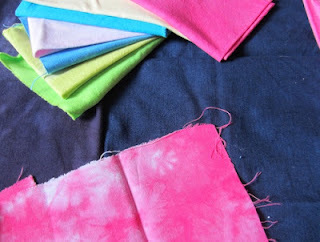 Today, I chose my fabrics for the next Twelve by Twelve challenge. Here they are on my design wall, next to three other pieces of the series. The new theme is "Sweet". 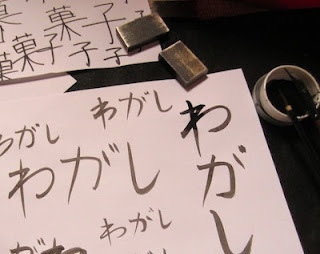 I spent some time this afternoon practising writing wagashi in hiragana with my ink and brushes. Tomorrow, I'll work on the kanji signs. 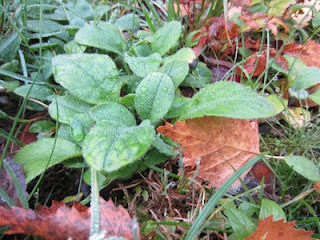 The weather has been pretty dull these days, but there will be some myosotis in the grass next spring! je ne saurais dire si ces mots sont corrects ou non mais je vois déjà d'après tes tissus que les sweets ou bonbons vont être un régal! Can't wait to see your new Twelve by Twelve addition! Gorgeous colours, Francoise and I love the idea of the text, looking foward to seeing how you work it. 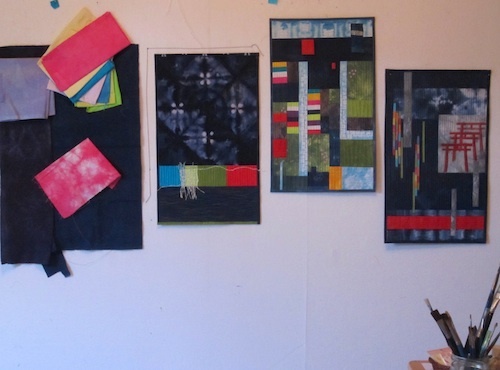 can’t wait to see what your Sweet quilt will look like! 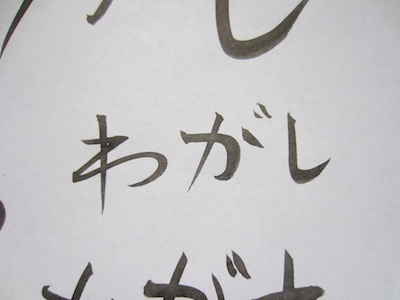 Your Japanese writing is impressive! Nice lettering & don't your quilts look great together! Thanks for your comment on our exhibition.